Japan’s Naomi Osaka has refused to criticise Serena Williams after her historic US Open victory was overshadowed by the American’s furious row with the chair umpire. The 20-year-old melted hearts when she broke down sobbing after thrashing her idol 6-2, 6-4 to become Japan’s first Grand Slam singles champion in New York last weekend. Japanese tennis legend Kimiko Date told AFP it made her “heart ache” to see Osaka reduced to tears and unable to savour her moment of glory. 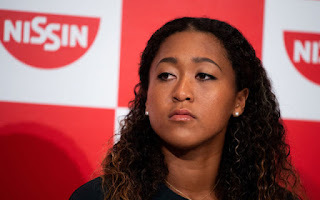 But after returning to Japan on Thursday, Osaka insisted there were no hard feelings towards Williams, who branded umpire Carlos Ramos a “thief” in an astonishing tantrum triggered by a code violation for coaching that culminated in a docked game. “For me I don’t feel sad because I wouldn’t even know what I’m expected to feel,” said Osaka, who has climbed from 19th to seventh in the new world rankings. “I don’t think I even thought about feeling sad because there’s no experience for me to draw on in any other Grand Slam final,” she added. Osaka, who competes at next week’s Pan Pacific Open in Tokyo, also revealed her plans to break into the top five this year — and win a shiny gold medal at the 2020 Tokyo Olympics. “I think for this year my immediate goal would be to get to Singapore,” said Osaka after putting herself firmly in contention to reach the season-ending WTA Finals. “Of course I’m very excited the Olympics are going to be held in Tokyo,” added Osaka, who is of Haitian-Japanese descent and was raised in the United States. Date, a former world number four, has tipped Osaka to become Japan’s first tennis number one. But for now Osaka is itching to do normal stuff — like catch up with big sister Mari, who is also a professional tennis player, go shopping and eat her favourite matcha ice cream. “I guess I’d like to hang out with my sister — I haven’t seen her since Wimbledon,” said Osaka, who has become an unlikely hero in a country still reeling after a summer of deadly typhoons and earthquakes. Asked how she felt about being a role model for young children, Osaka gave mixed signals.